Probably my favorite app game ever. It's so creative and it's unique format is extremely refreshing. It's funny, heart warming, suspenseful, and eerie all at once. The humor reminds me a lot of the novel The Martian; it's full of sarcastic one liners that make me laugh every time. 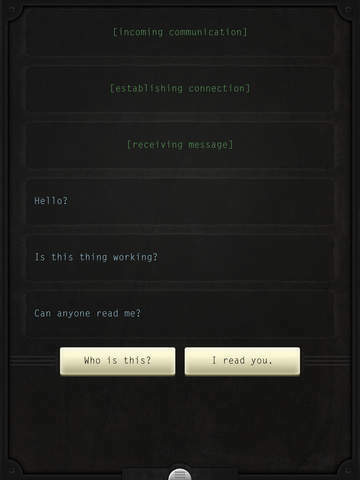 Plus it's text message style gameplay is increasingly eerie since it blends into the message notifications I get from real people, which gives the game a creepy, suspenseful edge. I read through a lot of the negative reviews posted on here and I couldn't disagree more. The character never once sounded "whiny" to me at all, especially considering his circumstance. Honestly, the character is extremely charming since he uses humor to deal with his stress. The pace is also not a problem for me. The game keeps you thinking about it long after you exit the app. Since the game plays out in real time, I often found myself wondering "I wonder how Taylor is doing" and whenever he messaged me I would exclaim "Taylor's back!" and my boyfriend and I would immediately dive right back into the insanely mysterious, sci-fi world that Lifeline creates. This is a game I'll be talking about for a while. It deserves twice the amount of stars I can give it. Okay, so I normally don't do reviews, but even though it's been a while I felt like I needed to for this one. I am a big fan of these interactive reading type games, and I downloaded this on a whim when it was the free game of the week (though it's most definitely worth its price). The gameplay is simple and immersive simply because there is nothing to distract you from the story, and I thought that the real-time delays (like when Taylor goes to sleep or is out exploring) made it even more believable. Story-wise, in my opinion, it could not be better. The way that you learn about this strange new planet, through his eyes, finding out information when he does, is what keeps you on the edge of your seat, and I love how the choices you're given can actually change what happens (I've played through multiple times). Taylor's sarcastic jokes also being a little lightheartedness to the whole rather intense story as well. I could not recommend this game more. I'm a frequent player of games like these, and it's not often that I come across one that leads me to care for the character so deeply. I actually found myself worrying about what would happen while waiting. It's a beautiful albeit a little creepy story, and worth every cent you pay. I downloaded this game when it was free app of the week and deleted afterwards so I had it in case, I came back to it about 3 days ago and I'm already so developed in Taylors life it's insane! She feels like a real person! I have never seen such a simple game pull of something this amazing! I really love the story, Taylor and the decisions that you have to make for her. You feel important because you have to help this girl survive, I don't know how to explain it in depth but it's just amazing! Try it out! What a fantastic game! It keeps you pulled in at every turn. Very in depth and well thought out. I really care for Taylor and hope the choices I am making turn out to benefit him. Cannot wait to purchase the second installment of the Lifeline francise. Whiteout! This is probably the worst game that I have ever played on my iPad and I've owned an iPad since 2010, generation 1. I want to play a game when I want to play it. This game forces you to play at the developer's pace, not your own. It is so slow I am bored out of my mind. It takes constant breaks, but won't tell you how long the break is, so you are forced to close the app and switch to a different game. I am a gamer, I will play a game non-stop for hours on my iPad until I can't play any longer. This game forces you to stop after a minute or two so you never get into the game itself. The concept is interesting but the options in responses are extremely limiting and result in the character acting like a brat that you are baby-sitting. This is supposed to be an intelligent adult but you are expected to make all the decisions for the character as though they have no brain in their head. In addition, you aren't given all the facts until you make a decision and then the character basically tells you that you chose wrong and whines about it before taking ANOTHER break. OMG, please do not play this game and waste your money. It is a total waste of time. I love this game. Simplest way to put it. It's breath taking and dramatic, scary but sweet, heart stopping but life pumping! Taylor (a lost astronaut) needs help. I will give you this summary to quickly define this games.... I'm going to say awesomeness: Meet Taylor, a astronaut stranded on a moonlike planet. He is a terrific science student who's number was pulled at a science fair and he was chosen to go on a spaceship. He was six days from landing when the ship crashed. He does not know how it did, but he at least manages to crawl into an escape shuttle. He crashes yet again in his shuttle and contacts you, the closest earth being to him. You communicate and talk, all the while you making life or death decisions for Taylor. Taylor also has a sort of.... Personality. He is halarious at times, others he is a freak show of frights. He can make your skin prickle or your heart warm. So will you kill Taylor with your decisions? Or will you help him survive..... And possibly get back home? I chose this bc of the great reviews and bc the concept is intriguing: a replayable adventure in space that relied on my choices. Instead, I'm stuck babysitting a whiny dork who can't make the most basic decisions to keep himself safe and who needs constant emotional reassurance. The decisions I'm asked to make are "go east or west" (without any description of what's east and what's west) and "chili with beans or without." Ugh. Not to mention that in a crash scenario, no one has even mentioned ACTUALLY GETTING THIS GUY SOME REAL HELP BY GOING TO FIND HIM! Maybe's he's so annoying that everyone else is just going, "leave him there, at least we don't have to listen to him anymore." This is in addition to the lack of control over the pace of the game. It goes at it's own pace, sometimes hours in between plays and sometimes just minutes. Notifications help, but they come in bunches that can be extremely inconvenient. I won't be buying any of the other games in the series. At first glance this would appear to be just a branching text based story game, but after waiting in real time for a response that may or may not come adds a whole new level of realism. Are You prepared to assist in another humans survival? Without seeing or hearing them? Do you have the wear withal to know what the right call will be? Are you going left or staying put? These questions and more are consistently running through your mind as you are constantly second guessing yourself with every break in communication. Lifeline is a very interesting game and I've enjoyed it so far, the story does and will pull you in if you allow it to. The subtle background music sets a tone of constant unknowing that never seems to go away. The story seems to break and wait in real time giving you almost a subconscious connection to the Main Character wondering if your choice was the wrong one. All in all I am enjoying the game and look forward to my next communication with Taylor, I sure hope he's still alive.